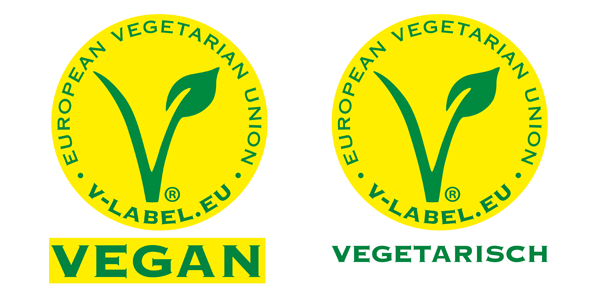 The V-Label is an internationally recognized quality seal for labeling vegan and vegetarian products and services. The V-label is licensed by the food sector since 1996. The label’s trade mark rights have since been extended to all European countries and many important markets worldwide. This quality seal is European market leader in the food sector and is used by regional producers and numerous commercial chains. The V-Label provides transparency and clarity. At a national level no legally binding definition of the terms “vegan” and “vegetarian” have been adopted yet. As a result, the reliable labelling of vegan or vegetarian products according to standardized criteria is difficult and can lead to incorrect or misleading labelling, which causes uncertainty among consumers and producers. Consumers are increasingly calling for transparency so that they can identify vegan and vegetarian products quickly and with confidence. Currently, only the V-Label can ensure clarity by labelling vegan and vegetarian products according to standardized criteria. Regular inspections carried out by an independent laboratory guarantee compliance with these criteria and thereby contribute to quality assurance of the V-Label. Food products and restaurants, but also a variety of other products, such as textile fabrics, cosmetics, detergents or cleaning agents can carry the V-Label. After the company has concluded a license agreement with the Vegan Society Austria (VGÖ), the auditor will review the requirements of the V-Label (such as the declarable and non-declarable ingredients and additives used, or the risk of cross-contamination) in the course of an audit on-site. Any recipe changes must be reported to the Vegan Society. The production process must be designed in a way that there are no unintended traces of non-plant based ingredients. Furthermore, the products can be labeled with additional allergy information in accordance with the Allergen Regulation.